Choosing a professional window cleaner to take care of the windows for your business can be daunting as there are many window cleaning businesses out there promising the best job. 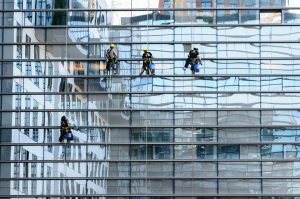 There are several factors to look out for when contracting a commercial window cleaning company. The most attractive and reassuring attribute a commercial window cleaning company can possess is experience. There is no doubt that having an experienced team cleaning your windows is much more reassuring than amateurs, especially if they are cleaning at a height or at dangerous angles. It pays to have somebody who has experience cleaning all types of buildings and levels. Another attractive attribute to have as a commercial cleaning company is training and accreditations. Being recognised and signed off by professional trade bodies means that clients can trust the window cleaning company. Ongoing training is essential in this industry as there are advancing systems, tools and health and safety regulations that window cleaners must be educated and trained on. Look for or ask to see accreditations and training certificates for peace of mind when selecting your window cleaners. It is important to employ a window cleaner who can actually get the job done and be flexible with their availability. A good attribute in a window cleaning company is the ability to be available when you need them and to be reasonable in instances that may include work at short notice. A commercial window cleaner that takes their health and safety seriously is important to look for when contracting a commercial window cleaning company. Be sure to assess and enquire about their health and safety procedures and how they carry out the work to be in line with health and safety regulations they are required to adhere to. Overall, there are many attributes to consider when choosing your commercial window cleaner. It is good practice to gather quotes, research the companies websites for experience and accreditations and ask questions that you deem a requirement to answer in order to employ the best possible team.